When I was a little girl, Barbie – who would be a vintage Barbie today was my favorite toy, along with all of the Barbie doll clothes I had to go with her. My twin sister, Carol and I usually played with her with our neighborhood girlfriends. Off we would go many a morning to their house with our packed Barbie cases in hand, not returning until our mom called us home for dinner. I can’t recall any other time in my life that I had such a large haute couture wardrobe that fit like a glove and was all neatly arranged and stored in a highly organized traveling closet. Early Barbie clothes were not just “doll clothes”, they were true miniature knock-off’s of late 50’s and early 60’s era fashions. They were made with great detail and the fashion trends of the times were closely followed making them highly collectible today. I don’t play with Barbie anymore, but thought it would be fun to see some of the favorite outfits I used to dress her with on a daily basis. 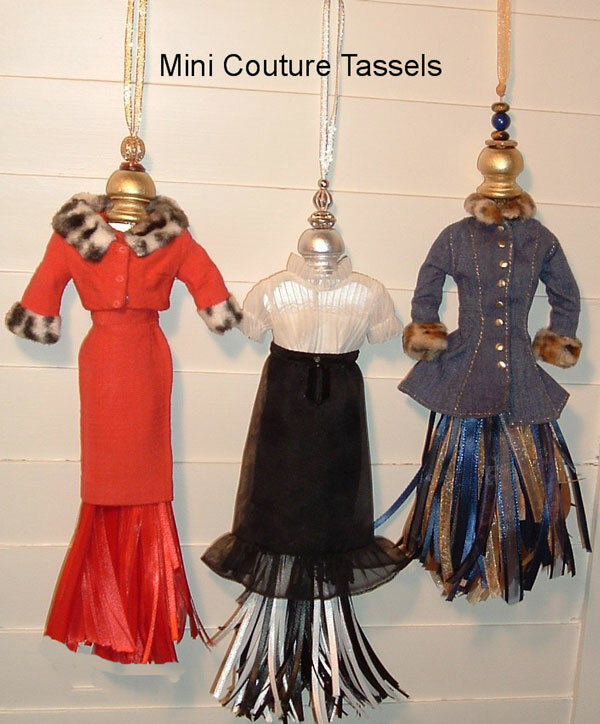 I didn’t want to display a doll, but came up with this tassel idea. The best part about doing this for collectors is that you don’t have to alter the dress at all. Turn back time and bring your childhood memories back by going up to your parent’s attic and dusting – off your Barbie stuff. I found that using outfits with high collars and sleeves look the best, but experiment with different outfits until you find one you like or that will coordinate with your decor. I used a wood piece that was shaped like a hanger. I found it at the craft store. It was called a wood leg. 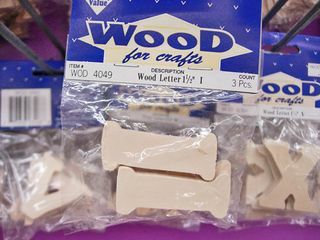 I went back to the craft store to get more, but they didn’t have any. You could use a Barbie hanger also. If you can’t find a wood leg or have a hanger, I saw these wood letter “I”s that would work just as well. 1. Spray paint the egg cup and wood leg with spray paint making sure all areas are covered. Let dry. 2. 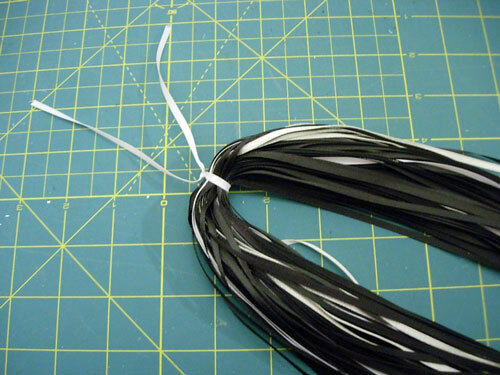 Cut one piece of ribbon to 18 – inches in length. 3. Fold ribbon in half to make a loop. 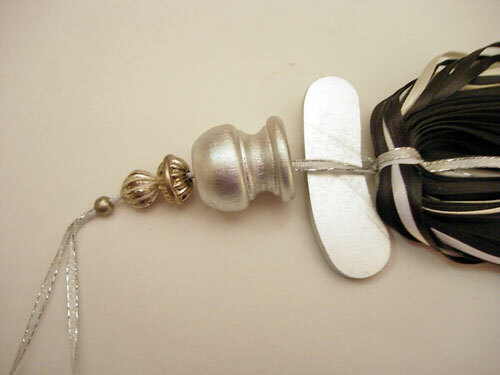 Thread beads and buttons onto cut ends of ribbon and slide them up the ribbon leaving about a 6-inch loop. 4. Thread the ends of the ribbon through the top of the egg cup until the bottom is snugly on top of the egg cup. 5. Tie ends around the wood leg or hanger. 6. 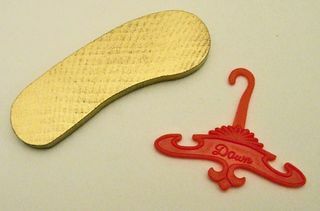 Place the egg cup and hanger into dress. Snap dress closed to see if you have enough clearance between the top of the dress and arms. Adjust length of ribbon between egg cup and top of hanger. Double knot under the hanger and let the ends hang free. 7. 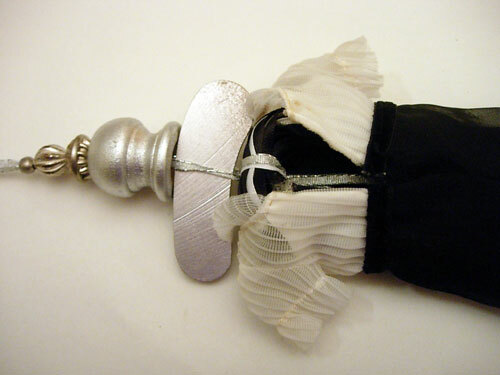 To make tassel: Determine how long you want ribbons to hang from the bottom of the dress. Cut a piece of cardboard to that measurement and add the length from the bottom of the dress to the bottom of the hanger. This will be used to wind the ribbon around. 10. Cut a 6-inch piece of ribbon and tie a knot around the center of the pile of ribbons. 11. Tie the tassel to the hanger using the two ends of ribbon extending from the hanger. 12. Put the dress onto the hanger and snap the dress closed. Fluff the ribbons, if necessary trim the bottom of the ribbons. I caught my breath when I saw this….what a fun, fun, FUN idea!!! I’ve been wanting to display my old Barbie clothes for ages…..old….ones….’60’s…and now I am going to copy your idea. Love it, thanks for being so creative and sharing!!! You are very talented and creative! The pictures are wonderful. Oh my! Now THIS, I love:) Thanks for sharing! Aww, this is such a fun idea, I love it! Thanks so much for sharing these, I’ll be linking. This is a project after my own heart. I adore Barbie! What a fantastic way to show off her outfits (I still have mine). This is just about the cutest idea ever. Oh, my word! These are just too adorable. I love the red suit. This is so creative. I love them. What a cute idea. I’m stopping by via SITS Saturday Sharefest to say hello. Happy SITS Saturday Sharefest! That is just about the cutest thing I’ve ever seen. I immediately pictured them hanging off the knobs on an armoire in a tween girl’s room. That has got to be, not only the best thing I’ve seen recently, but the most creative! This is so great! Unfortunately, my Barbie stuff was thrown out long ago by my parents and they would be antiques, I mean classics, at this point. I love these!! Very unique! I love your tassels, what a good idea! ADORABLE!!!!!!!!! You could even use the body-part of a very cheap dollar store barbie too I guess…MMMMM gotta make one myself, Love it, so pretty!! Do you mind if I use (some of) the pictures on MY blog one of these days? It is SO cute. Hugs, and if you say yes ofcourse I will link back to you. I will use it on my Dutch blog and translate it in Dutch. Love,love,love this! Where are you hanging the tassels? Bulletin Board? I love these so much. What a creative and wonderful idea. I had a Barbie doll and clothes I made for her but I also had a little sister who ruined it all. Maybe the thrift stores have some though… It would be fun to go on the hunt for them.